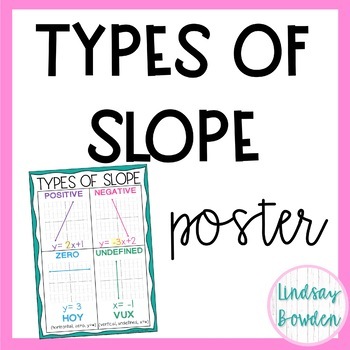 This poster displays the 4 types of slope: positive, negative, zero, and undefined. There are graph examples with an equation. 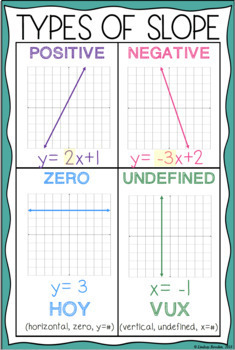 I also included HOY and VUX to help students remembers zero and undefined slope. Printing: This poster is designed to be printed as a 24" by 36" poster. If you have Adobe Reader (free to download), then select the "poster" option when printing. Your poster will be printed on multiple 8.5"x11" pages that can be put together as a poster. You can also use a poster printer (some schools have them or an office supply store like Staples).